I’ve been so busy the past week or so that I totally forgot to post up a link to an article I wrote for SearchVMware regarding the recent announcement of the end of the C# Client! The clever bods at VMware labs have just released another new Fling… and this one’s a damn awesome Fling! 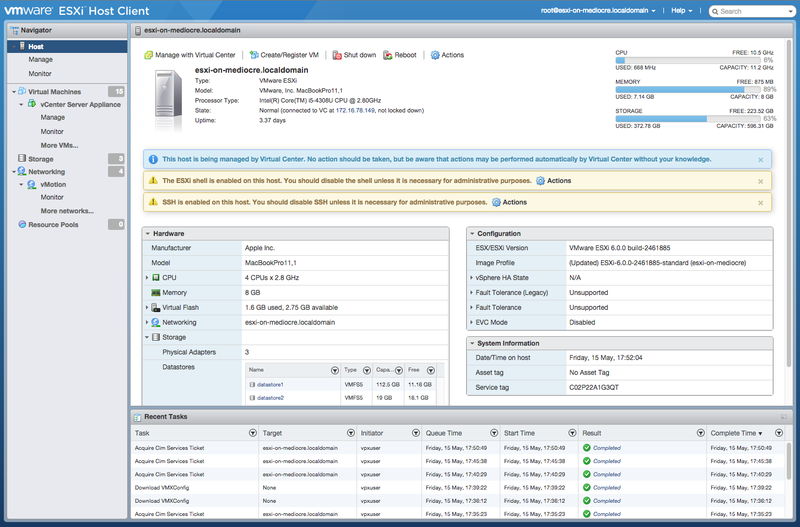 What it allows you to do (after installing the VIB) is to open up a browser to your ESXi host and gain access to a simple client allowing you to manage your freshly installed ESXi host (for example if you haven’t yet deployed vCenter Server or don’t have access to the C# client). The look and feel of it is very similar to the current Web client…. very simple to navigate and access the features/functions. Only issue is it’s a VIB which means you need to copy it across to your ESXi host (using a SCP tool like WinSCP). Hopefully the next version will be a fully packaged installer that asks for the IP address of your ESXi host and goes off and deploys the VIB automatically!